In today’s article, old Don Tano is gonna tell you everything you need to know to visit the biggest of the Egadi Islands: Favignana. Read this comprehensive and handy guide to make sure you have the best trip! Buongiorno a tutti! Today is a splendid sunny day in Palermo (like most of the time) and this warm day and the fresh smell of the open sea coming in over the beaches makes me think about of or my favorite places to visit in Summer: Favignana. Favignana is the largest of the Egadi Archipelago located about 7 km (4 miles) off the west coast of Sicily, between Trapani and Marsala. This name “Favignana” is derived from the Latin word “favonius“, a Latin term used by Romans to indicate the hot wind coming in from the west. To visit Favignana (usually the first and in most cases, the only) stage of a trip to the Egadi Archipelago. 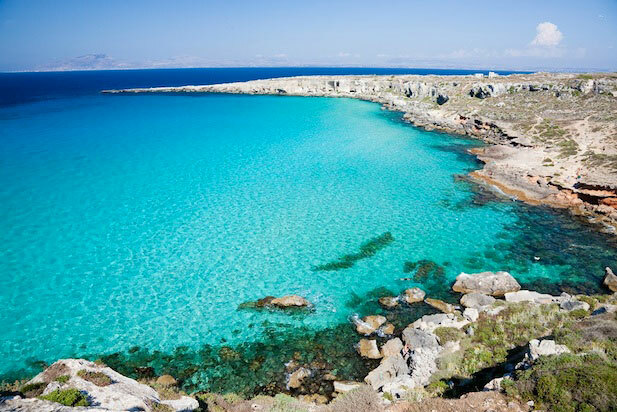 Favignana is not only the largest but the liveliest and arguably the most beautiful of all. This is not to take away from the wilder Marettimo and Levanzo Islands, which in their own right are incredibly beautiful, the winner is definitely Favignana. However, if you have the time, you can take a boat tour from Favignana and visit them too. Now I’m gonna show you what you need to know about Favignana in order to spend a great vacation. Favignana is not your classic touristy island with thousands of ready-made activities organized by the local operators and promoted on every corner, but rather a quiet place where you have to work a little harder on your own to arrange a daily plan. Circumnavigate the island (or take a tour). You don’t have to be a ship’s captain to understand the best way to enjoy the sea is from the sea itself and therefore unless you’re able to talk on water, a boat seems to be your only as well as affordable solution. There’s nothing like that great feeling of being a pirate on the open sea. And you can be a pirate too if you like. It’s fun and affordable. A memory that will stick with you for years to come. If you don’t really want to risk learning to walk on water (and after all, only a few have managed to do that throughout history) and hope to rent a boat, you’re gonna have to book it well ahead of time because otherwise you’re gonna find it nearly impossible even if you know the man who did walk on water. Whatever sort of boat you take, going around the island to the discovery of all the slices of heaven this can hide will be an unforgettable experience. Small boats don’t require a license. And don’t forget to bring a mask for snorkeling! One of the island’s highlights offers breathtaking locations offering diving both for beginner and for experts alike. Here are some of the most popular spots where the locals go. I don’t get to see these lovely places anymore, because of my ID, my doctor and in particular, my wife, say I’m just too old to go diving. According to Riccardo, a must-see, as well as an easy dive, is in the Galeotta. This is a small island animated by intense life, so you’re almost certain to encounter herds of diplodus, dreamfish, octopus and moray eels. 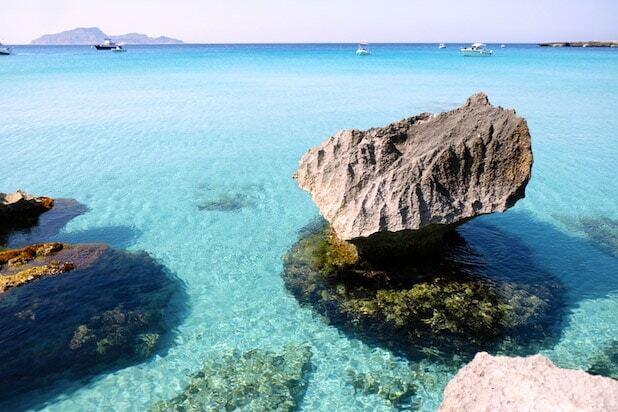 Another easy dive with plenty of charm, is the dive at Cala Rotonda. This diver takes you into a cave whose entrance is located at a depth of 8 meters. It is about thirty meters long and inside, you’re gonna find umbrine, brown meagre, congers and moray eels. Finally, if you’re looking for more excitement, the Secca del Toro is suitable for mid-level experts and is considered the most beautiful dive of all, but also, possibly the more dangerous. As Riccardo says it’s suitable even for beginners who go along with an experienced diver, but not for facetious idiots looking to do something stupid. Here, you’re gonna meet with a variety of exciting species and colors such as yellow and red gorgonians, a multitude of yellow cluster anemone and Mediterranean fan forms. 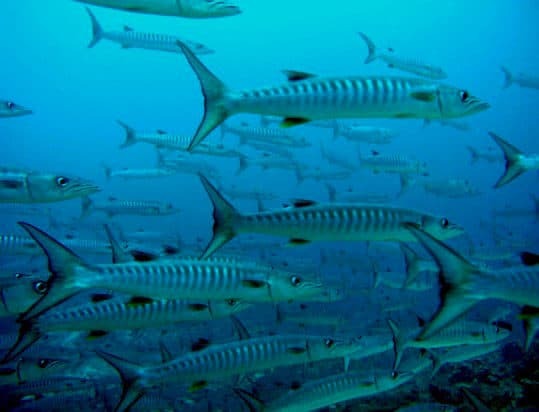 Often you’re gonna see shoals of barracuda that inhabit the area. Another dive (for experienced divers) is the beautiful dive at Scoglio Corrente. It’s a point characterized by the strong currents, but thanks to these, the dive here is particularly interesting as it represents a possible point for large fish-hunting. If you want to go for a dive, you can visit Egadiscubadiving.it and book your dive with my friend Riccardo. If you don’t intend to dive for some three hours after dining, you definitely must try the local cuisine — and it goes without saying that the protagonist here is His Majesty’s fish (sorry, red-meat lovers. This island isn’t the place for you). However, if you’re a vegetarian, you’ll be happy to learn that you’re gonna find amazing vegetables. 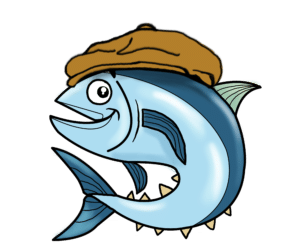 Sorry about the red meat, folks — I grew up dining on fish. 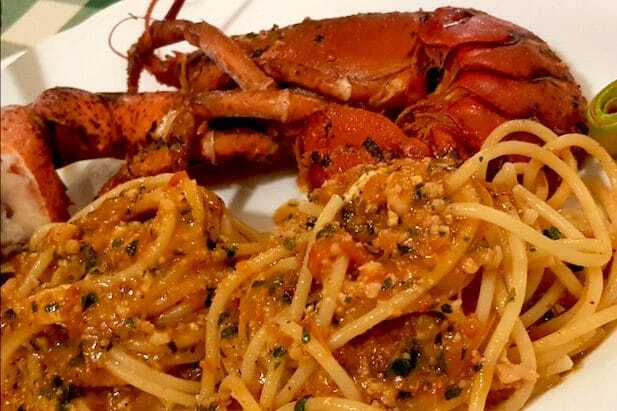 If you want to return home without remorse, you can try couscous, spaghetti with sea urchins, pasta with lobster, red grilled tuna steak and tuna tartars just have to be on the list of delights to be tried. You should also try the pane cunzatu (a sandwich of seasoned bread containing tomatoes, mozzarella and basil. The more sophisticated sandwiches include anchovies or tuna. 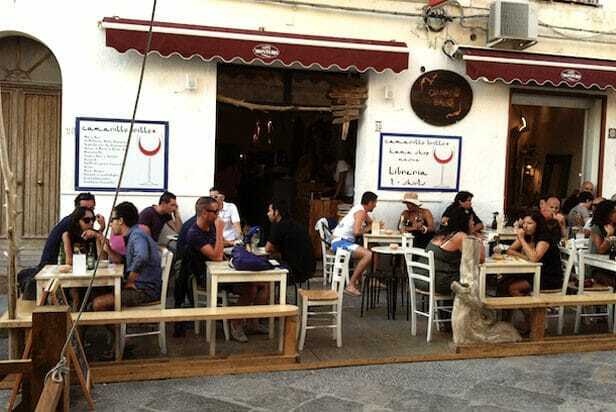 It is loved by the natives, but the best (and original) is definitely in Scopello Village. Very good. Although there are plenty of good places to eat great food, each year the rank changes. If you want to stay on the safe side, you might opt for the following places which seem to offer the same good quality with every passing year. Quello che c’è…c’è (Family run). A climb to the castle of Santa Caterina where you’re gonna enjoy the most beautiful Sunset. Take your better half and climb to the highest point on the island to reach the castle of Santa Caterina and enjoy the breathtaking sunset. This is an exceptional workout for your heart — not only because it’s a very romantic place, but it offers an easy 45-minute walk with a good workout included. You could also reach half of it by bike. For history enthusiasts, during WWII, this abandoned castle was used as an observation post to help the local government see enemy ships from afar. In itself is nothing special, nothing like the castles you see in Disney movies. It’s just an abandoned historical corner imbued with the history which turned it into a great spot for taking pictures and a different point of view (and to win damsels of course). 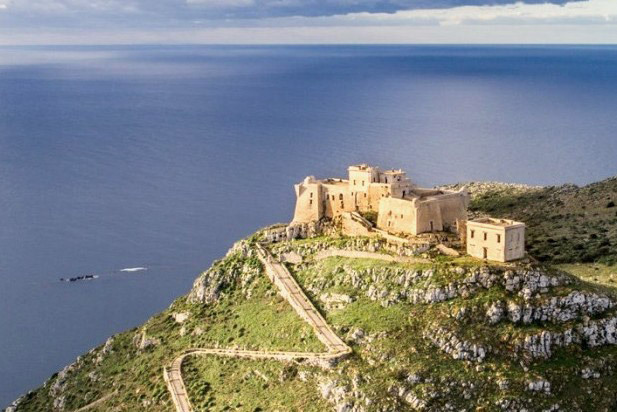 The scenery is 360 degrees and does allow a spectacular view of the Egadi Islands, Trapani, Marsala and beyond. This former Florio factory, while a true jewel of industrial archeology, but it was the largest place where the equipment, anchors and the bots of the mattanza (killing) were maintained. It also represents the history of the Florio family and its intertwining with the life of the island’s two found social redemption from poverty and their primary source of economic subsistence. However, if you’re an animal rights activist, you may want to skip this place — and rightly so, but its rich history makes a visit to the former tuna Florio factory essential for those who want to experience a journey in the thriving past of the tonnara. 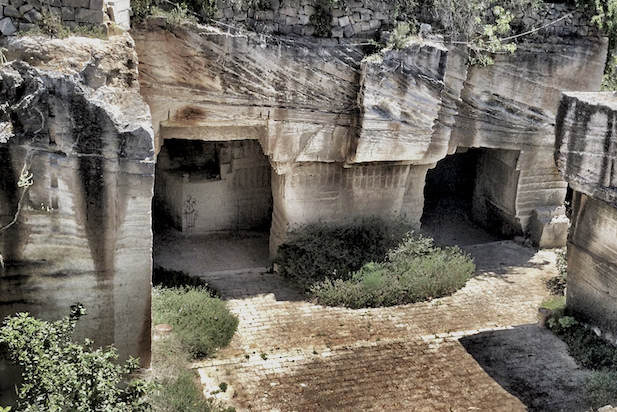 From the belly of Favignana, an extraordinary stone called Calcarenite was formally extracted. It’s a type of limestone that is composed predominately over 50 percent, of detrital sand-sized (0.0625 to 2 mm in diameter), carbonate trains. Calcarenite is considered quite valuable for its compactness and fine grain, but also for the brilliant white color due in particular to its concentration of calcium. This stone is rather inappropriately called “tuff” and one time, the stone’s extraction represented one of Favignana’s most ancient and peculiar activities. This work was quite laborious and consisted of only a few tools. The first electric machine used to cut the tuff was introduced in 1949, but there was no real standard procedure. Rather, transfer and techniques had to be transmitted from father to son. Through the passing of time, the extraction of tuff began to suffer from the crisis to the inability the locals failing to adapt to changing conditions of the location as well as changing competitive prices. One by one, the caves closed. Today, only one is active with few employees. The abandoned tuff caves of Favignana were used by the Islanders in an original and smart way. They were transformed into gardens. In Cala Rossa, Bue Marino, Punta Fanfalo and Lido Burrone, you will still see the tuff quarries along the edges of the roads where the lushest plants grow. I’d better warn you right away without beating about the bush, that you should  get your accommodation in the city center and surroundings in order to get the most of your vacation. Everything revolves around the center of Favignana. Supermarkets, restaurants, bars and shops, and anyplace that passes for boat rentals, scooters, bikes as well as cars — not to overlook the fact that the port is within walking distance from the city center. Apart from your time at the beach, you’ll be spending plenty of time in the city center, so it would be a convenience to stay there. In a nutshell: Unless you enjoy running around cursing loudly every minute spent because you have taken your accommodation from far away just listen to old Don Tano, and get an accommodation close to the center. If you plan to spend the summer on Favignana, you should book your stay well in advance unless you want to avoid high price in high-rises, and I mean high in every way or even worse, you may find the island completely booked up. Below are three good choices based on three different price ranges. All these are well-located. The first two are in the city center. Camping out can be lots of fun, it’s affordable and is less than a fifteen-minute by bike to the city center. Good for the heart. If you’re not inclined to bike, you can rent a scooter or car and it only takes a couple of minutes. I swear — each time I visit Favignana, I wish I could be like Robinson Crusoe and stay for a full 28 years and more, but for some reason, after a couple of weeks, mia moglia wants to get back to her own kitchen in Palermo. Of course, if you’re the average tourist with limited time for a vacation, I recommend a stay of 3 days (2 nights). This should be enough time for a great visit and wonderful memories of Favignana. I get lots of mail asking me if it’s possible to visit Favignana round-trip in one day. The answer: No. 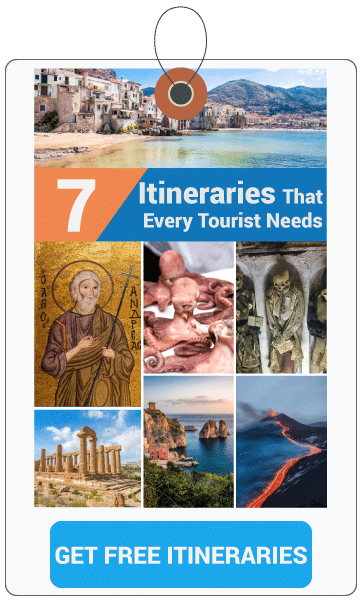 Okay, it may just be possible, but only after you spend the night in Trapani (the city where the following morning you’ll take the ferry that takes you to Favignana and the other Egadi Islands). The hydrofoil leaves early in the morning and returns to Trapani in the evening. If you decide that’s for you, the ticket offices are located in front of the pier where the boats depart. You’ll be wiser, however, to book online. The hydrofoil to the Egadi, but I highly recommend getting your ticket(s) as far ahead as possible, especially for trips during July and August. You can also buy them at the port — just bear in mind that during summer months, hordes of people from every corner, not only of Sicily, but hordes of tourists from all over the world descend on Favignana — and for good reason. Everybody loves Favignana! Favignana is a small island, so the good news is that you can circumnavigate the entire island in one day. You can rent a Vespa or a vehicle — your choice. Since Favignana represents a tourist hub, you’re sure to find a shop to your liking. No lack of those. Ideally, you should have old Don Tano with you but you’re gonna have to be on your own. Scooter rentals include helmets and sometimes, anti-theft locks. But it’s not to worry about that. On Favignana, there is apparently a guardian angel who looks after bikes and scooters! As elsewhere, prices are always attached to the season. They range from 4€ to 30€ daily bike rental. An automobile or a scooter may cost you 30€ to perhaps 70€ per day. I’ll tell you an open secret: In all of Sicily, there can be no better place to party than Favignana. For all that, you won’t hear loud music or see drunks taking a pee in public or prostitutes or drug either. In short: the deadly sins are quite limited here. People do enjoy nightlife but no loud DJs and craziness. Only on rare occasion can you dance to live music in the main square. Attention Romeo: that doesn’t mean you won’t be able to find your Juliet. You just won’t find them staggering around on spike heels and skin-tight leather. The same holds true for their Romeos. Most people stop first for an aperitif at places such as New Albatros, Camarillo Brillo, and Monique. After the aperitif it’s time for dinner at one of the many restaurants in the center of the island. It’s not unusual for other villages to arrange private parties, but these are only learned about through word of mouth. Old Don Tano won’t steer you wrong. Don’t miss the change to rent a boat, even if for one day, In any case here are the best beaches on the island. All the above are, however, rocky. The only sandy beach is Lido burrone, (the most comfortable as well.) It’s also the only beach where you can rent beach umbrellas and have a nearby kiosk with refreshments. On the other hand, those who rented a boat you can visit the following beaches. If you’ve been following my blogs, you know that I always recommend renting a car. Otherwise, you may just have to be institutionalized after dealing with public transportation and expensive taxis. You can rent a small car for very little and you’ll be King of the Road! When driving you take the A29 highway from Palermo to Trapani for about 60 miles (100km).Still no car? Okay, you can still get there by coach with the Segesta Company. You’ll board the coach at Via Filipo Turali 3. There is normally a coach about every hour. Cost: 9.60€ one-way. A round-trip ticket will be 15.10€. To return to Palermo, even if you haven’t got a ticket, you can still pay on the coach. Once you’re in Favignana, you may have time to visit the other two Egadi Islands. You can reach them by Liberty Lines hydrofoils — of course, there are (more expensive) boat tours. The hydrofoil takes from 30 to 45 minutes to reach Marettimo and a round trip will cost about 12€. Levanzo is closer, about 10 minutes and a round trip will cost about 7.50€. The cost isn’t a bad value at all, and you’ll probably really enjoy the ride. But another possibility exists (this is for the young single guys). 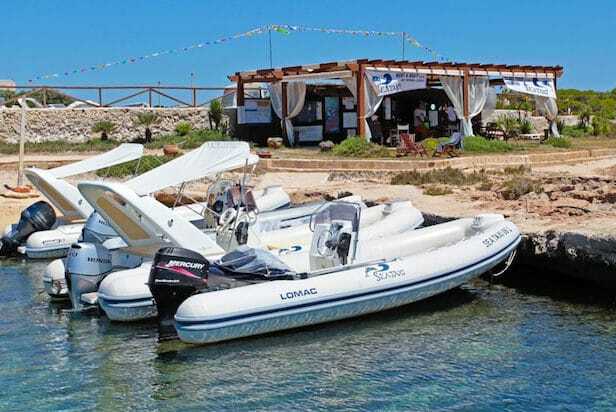 There are many stalls where you can rent a private boat excursion in Levanzo and Favignana. Of course, these cost more, but with a beauty at the helm to entertain you, it’s worth it! I hope I’ve given you all the information you’ll need for your next vacation to the Egadi Islands, but if not, be sure to drop me a comment in the box below and I’ll get back to you as soon as I can.